so i can’t sleep or i guess i should say i woke up too early – like 4am too early. is this what happens when you get on the wrong side of 40? oh well, my mind is going like crazy with the scent of possibility for the day. so i’m cruisin the world wide information superhighway and i find this great article over at apartment therapy. 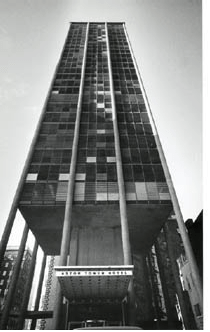 i realize that THIS IS MY OLD BUILDING ON ASTOR TOWER IN CHICAGO! those of you who knew me then will see it too! 1. they filmed ‘what women want’ with mel gibson and helen hunt on my street . it was helen hunts place and i met mel and watched them film one scene over and over again. he was real nice – chain smoker. 2. they filmed the sequel to ‘the fugitive’ and turned my street into new york city and the light gaffer was on a huge crane which sat even with my window. i would give him a little wave every night when i got home. met tommy lee jones. 3. andrew cunanan parked his red jeep outside 1300 astor in 1997 when he killed lee miglin who lived on astor. i was walking in lincoln park with my head phones on and was walking towards home when i saw all the cop cars – like 40 or so cop cars lining my street. it was real scary. especially seeing the WANTED signs in my neighborhood. 4. my brother and i used to cook corn on the cob on the grill on the roof. the roof was amazing and everyone wanted to hang up there. it had sweeping lake views and you just felt so small yet majestic. 5. the doormen were awesome. i bet daniel and john are still there. they would always make me laugh and they really cared about me. even though it has been 11 years since i lived there, they would welcome me back with a huge hug if i saw them today. they took my calls, let up my visitors, gave me the gossip. 6. one day i came home from work and john who was an older doorman with a very thick hungarian accent was so excited to see me that he ran halfway down the block. he said that I WILL NEVER GUESS WHO WAS AT MAXIMS IN THE BUILDING FOR LUNCH… president bill clinton! that was pretty cool. i have to say it really made me happy thinking back on those times – what a steal! it was only $750 a month and even back then that was cheap! love you deb! Hi! I lived in 10a for years. I sold in 2004. I so miss living there. John just retired last year. Daniel is still working there. I run into Daniel every so often at the jewel in River Forest…and yes, they were the best. 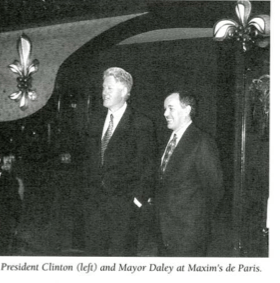 One of my favorite stories was when Clinton dined at Maxims. Secret Service let me in after verifying my license and there were sharp shooters all over the surrounding buildings. When I left for work that day sround 3:30-4 100’s of people were cheering, it was like a movie. How great to hear from you! Those were the days – living there for sure!